After the first was discovered in November 1974, three more tunnels were uncovered in the following decades. All four run either below or nearby the Demilitarized Zone in the South and have been altered since to deprive them of their initial purpose. The Korea Herald visited the third tunnel Tuesday. The tunnel is 73 meters below the surface close to the truce village of Panmunjeom and stretches 1.6 kilometers. It is also the tunnel closest to South Korea’s capital, lying only 44 kilometers north of Seoul. When it was first discovered in October 1978, it stretched 435 meters into the South and 1.2 kilometers up to the Military Demarcation Line, the strip of land that separates the two Koreas. The search for the tunnel was launched on a tip from North Korean defector Kim Bu-seong. The North claimed it was an abandoned coal mine and denied it was a violation of the armistice agreement signed in 1953 to halt the Korean War. But evidence of coal was found only around the entrance, along with signs of dynamite blasts directed toward the South. Today, visitors and tourists can explore up to 265 meters of the tunnel, in which three concrete blockades are installed to fend off North Korean forces. It is believed to have been capable of transporting 30,000 troops in an hour. 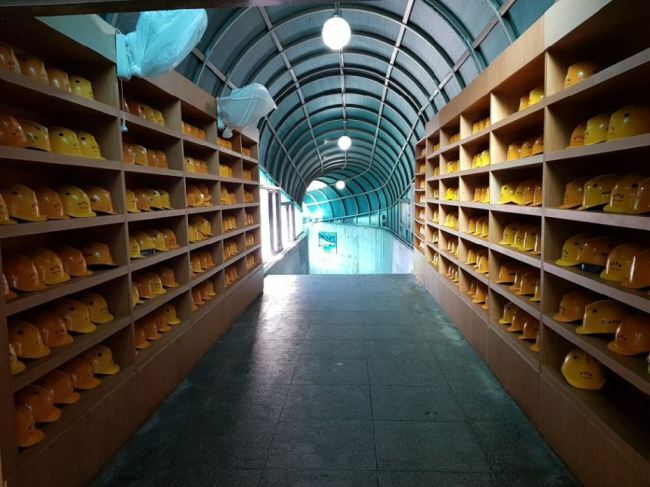 Visitors are each handed a yellow safety helmet at the entrance for the relatively low rock ceiling that is about 1.6 meters high. Before entering the main tunnel, they must walk down a steep 358-meter passageway built by the South that acts as a gateway. The entire trip back and forth takes 20 minutes by foot and less when taking the rubber-tired train that connects the top and bottom. The air in the tunnel is humid, with underground water constantly trickling down the rock walls. Visitors enter and leave in single file through a narrow passage 2 meters wide. Photography is forbidden within the tunnel. More than 60 tourists from the United States, China and countries in Europe were at the site, curious to see the preserved byproduct of North Korea’s drive to reign over the Korean Peninsula. “It feels like the world we live in is constantly under attack these days,” Mark Hastings, a tourist in his 40s from New York, told The Korea Herald. He admitted that some of his friends back home warned him of the ongoing North Korean provocations before he left for South Korea. “But (the tunnel) is living history -- it’s something that’s active and showcases a real threat to the current situation,” he said, adding that the tunnel was an “intriguing experience” for him. 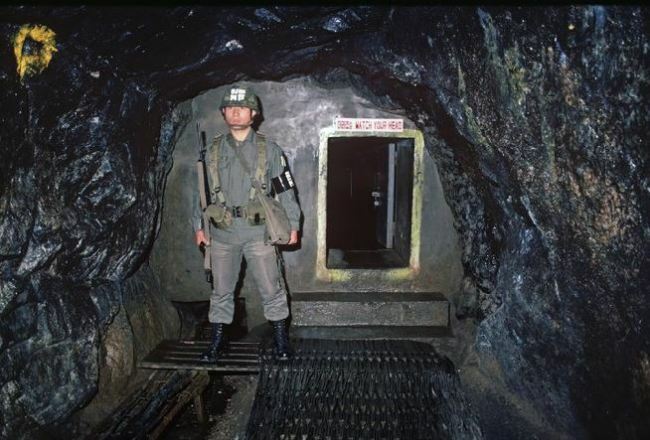 The South Korean government has consistently searched for additional tunnels, although the latest and fourth was discovered 27 years ago. The secret passageway of 1,052 meters was uncovered nearly two decades after the unearthing of the first. North Korea’s series of relentless military provocations this year has brought a heightened sense of security awareness here, reminding residents in South Korea that the two nations are technically still at war. On Nov. 13, a North Korean soldier was shot while defecting to the South via the Joint Security Area and later taken to a hospital here in critical condition. Other North Korean troops reportedly fired about 40 rounds at the fleeing soldier. It was the first shooting at the JSA since North Korean and United Nations command soldiers traded gunfire when a Soviet citizen crossed the border in 1984. The DMZ has been relatively quiet for a border that stands to separate the temporarily halted hostilities of war, but the silence was recently ruptured by the fortunately rare sound of gunfire. It was a jolt to the system and a reminder that the threat of war is always lurking on -- and perhaps beneath -- the peninsula. To visit the 3rd tunnel, the most convenient option is to participate in a full 5-hour DMZ tour program via travel agencies. The prices range from 36,000 won to 56,000 won ($33-$51) and the program is usually offered in English. Another option is to purchase a bus ticket to the DMZ at Imjingak, a recreational area near the 3rd tunnel in Paju. The ticket price for the tunnel is included in the transportation fare of about 12,000 won. The nearest train station is Dorasan Station, home to the Gyeongui Railway Transit office and the final stop of the DMZ train, which can be boarded at Seoul Station. Unauthorized vehicles cannot enter the area. All foreign visitors must carry passports to enter the DMZ and nearby areas, while South Korean citizens can present other IDs such as driver’s licenses.